Prolific artist with a preference for oil pastels and watercolor paintings. Work has a heavy emphasis on representative figures of animals and persons. Has a seemingly effortless approach to art and a strong sense of composition and bright colors. 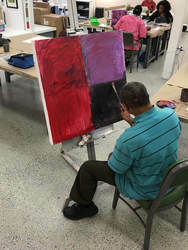 Since 2013 affiliated with Art Enables, a DC vocational employment non-profit for artists with disabilities. Has an intellectual disability and mental retardation, so Art Enables staff is applying on behalf of him. ​"Gary is a man of few words but possesses a calm and gentle presence. A native Washingtonian, Gary is one of Art Enables’ more recent resident artists. His work, largely abstract, possesses, like Gary himself, a warmth and almost Buddha-like quality to them. Heavily layered, his pieces, and the people in them, are both simultaneously complex and simple. His minimalistic style of detailing people and faces evoke a depth of expression and emotion that is immediate and powerful."